Plato’s description of his ideal republic appears to stand in stark contrast to what are widely held to be core American values, including social mobility, freedom, and equality. Indeed, Plato imagines a republic rooted in hierarchy and inequality, where people are bred and educated to be members of certain classes and perform specific societal roles. According to Plato, “we aren’t all born alike, but each of us differs somewhat in nature from the others, one being suited to one task, another to another.” Through selective breeding and differentiated education, Plato’s republic cultivates each person to perform his/her predetermined role as a member of a distinct class. Furthermore, using censorship and state lies, the rulers of Plato’s republic make rebellion and revolution impossible. Plato’s “Myth of Metals,” or “one noble falsehood,” functions to make people amenable to the hierarchy of the republic. According to this myth, people are created with either gold, silver, iron, or bronze mixed into their souls, making them rulers, auxiliaries (soldiers), famers, or craftsmen respectively. Thus inequality is both naturalized and valorized. Although Plato’s republic may seem abhorrent to Americans raised on the ethos of the American Dream, it is not impossible to imagine the American Dream as its own kind of “noble falsehood.” While the American Dream leads Americans to believe that through hard work, anyone can achieve success, the reality is often quite different. Indeed, my examination of the school-to-prison pipeline will ask whether the way the American education system funnels certain children into prisons by talking about criminality rather than systemic racism or failing schools is really so alien to Plato’s ideal republic. This October 26 video linked above from South Carolina’s Spring Valley High School shows a white police officer violently grab an African American student seated at her desk, throw her to the ground, drag her across the floor, and handcuff her. The video immediately went viral; indeed, an important difference between our contemporary world and Plato’s republic is that modern technology would render any attempt at total state censorship impossible. In addition to contributing to current conversations about racialized police violence, this video reignited national discussion of the school-to-prison pipeline. This term describes the phenomenon by which American children are funneled out of school and into the criminal justice system. The American Civil Liberties Union explains this happens because of the underfunding of public schools, the institution of draconian zero-tolerance policies, the elimination of due process for students, and reliance on law enforcement rather than teachers and school administrators to discipline students. According to a 2013 New York Times article, these policies were prompted by an increase in juvenile crime in the 1980s and the Columbine High School shootings in the 1990s. Significantly, however, the school-to-prison pipeline does not impact all American schoolchildren equally. The infographic below illustrates that it is disproportionately students of color – like the girl from the video – who drop out of school, experience expulsion, and find themselves entangled with the juvenile and criminal justice systems. Indeed, it appears there are no easy solutions. Although the American education and criminal justice systems may not be as impenetrable as the mechanism of state control outlined in Plato’s Republic, it is still difficult to figure out how best to divert at-risk students from the school-to-prison pipeline. Combatting systemic racism is no simple task, particularly because this racism is cloaked in myths about certain students’ criminality. Furthermore, while Plato’s ideal republic had rid itself of criminals, this is not the case in the contemporary United States. It’s a reality that’s decidedly not ideal. American Civil Liberties Union. 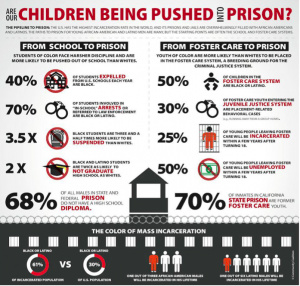 “What is the School-to-Prison Pipeline?” Accessed November 9 2015. https://www.aclu.org/fact-sheet/what-school-prison-pipeline. Amurao, Carla. 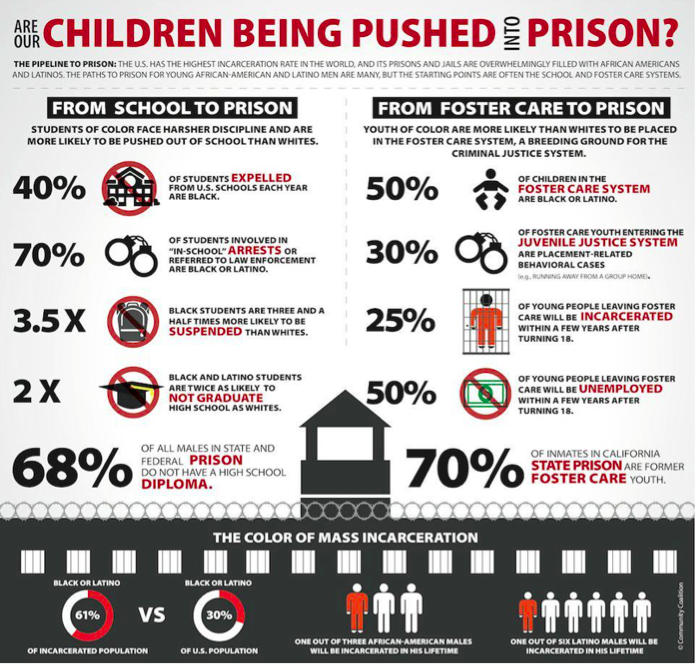 “Fact Sheet: How Bad Is the School-to-Prison Pipeline.” Tavis Smiley Report. Accessed November 9, 2015. http://www.pbs.org/wnet/tavissmiley/tsr/education-under-arrest/school-to-prison-pipeline-fact-sheet/. “Is This Working?” This American Life. October 17, 2014. Accessed November 9, 2015. http://www.thisamericanlife.org/radio-archives/episode/538/is-this-workingAct. Plato. Republic. Translated by G.M.A. Grube. Indianapolis: Hackett Publishing Company, 1992. Seabrooks, Reginald. “Police Officer Grabs High School Student.” New York Times. October 27, 2015. Accessed November 9, 2015. http://www.nytimes.com/video/us/100000004001301/police-officer-grabs-high-school-student.html?action=click&contentCollection=us&module=lede&region=caption&pgtype=article. “The School-to-Prison Pipeline.” New York Times. May 29, 2013. Accessed November 9, 2015. http://www.nytimes.com/2013/05/30/opinion/new-york-citys-school-to-prison-pipeline.html. Plato, Republic, translated by G.M.A. Grube (Indianapolis: Hackett Publishing Company, 1992), 45. Reginald Seabrooks, “Police Officer Grabs High School Student,” New York Times, October 27, 2015, accessed November 9, 2015, http://www.nytimes.com/video/us/100000004001301/police-officer-grabs-high-school-student.html?action=click&contentCollection=us&module=lede&region=caption&pgtype=article. “What is the School-to-Prison Pipeline?” American Civil Liberties Union, accessed November 9, 2015, https://www.aclu.org/fact-sheet/what-school-prison-pipeline. “The School-to-Prison Pipeline,” New York Times, May 29, 2013, accessed November 9, 2015, http://www.nytimes.com/2013/05/30/opinion/new-york-citys-school-to-prison-pipeline.html. Carla Amurao, “Fact Sheet: How Bad Is the School-to-Prison Pipeline,” Tavis Smiley Reports, accessed November 9, 2015, http://www.pbs.org/wnet/tavissmiley/tsr/education-under-arrest/school-to-prison-pipeline-fact-sheet/. “Is This Working?” This American Life, October 17, 2014, accessed November 9, 2015, http://www.thisamericanlife.org/radio-archives/episode/538/is-this-workingAct.